Oct. 12, 2005: Correction: Please note a change in email address below for Jim Sweet. One week until the Albany Meeting at Latham. Will you be there? We still need a member of 1956, preferably from the Greater Albany Area, to step forward as local Reunion Chair for 2006. Anyone have any ideas? And, if you have ideas about what you'd like to see as the 2006 75th Program, let us know. 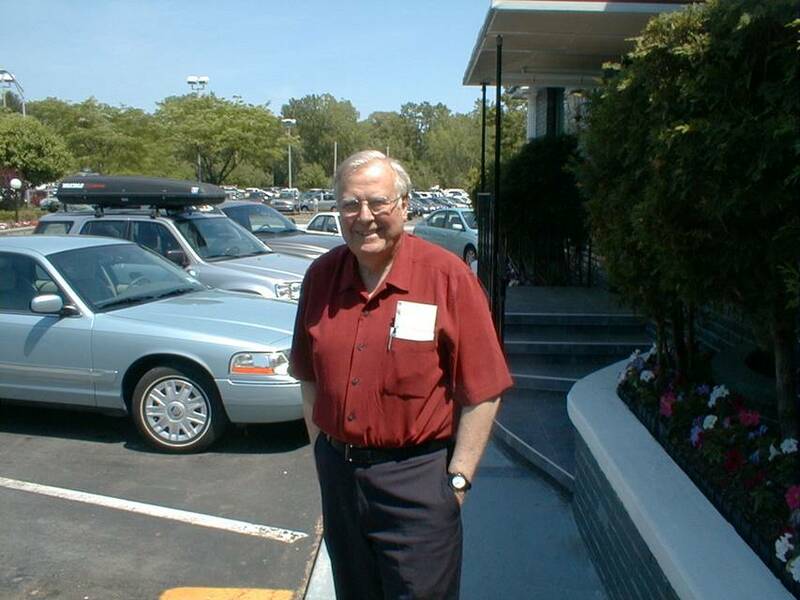 Sept. 25, 2005: An Update... The reunion pictures have been redone in a smaller format, so they should appear much faster than before and be viewable on your screen. You can get to them by clicking on Reunion Photos at the left. If you want a version of any picture at a higher resolution than appears here, send an email and I'll get them to you. We are still looking for other pictures taken at the Reunion. Send them along and we'll put them on the site. Another Potter President back from the dead! Bernie Robbins, 1957, and Club President in 1957, says that reports of his demise have been greatly exaggerated! The database info we had from the University had shown Bernie in the deceased category. My casual request for info from John Benton on what he knew about Bernie resulted in the comment, "I get a Christmas card from him every year!" John provided the address and phone number for Bernie and I gave him a call. He does not have email, but looks forward to the 75th Anniversary Reunion next year and to the 50th reunion of 1957 the year after. Fran Streeter called Bernie and asked him to call when he dies so we will know! Bernie's address is: PO Box 2025 Sylvan Lane, Truro, MA 02666. Sept. 19, 2005: The 2005 reunion in Mayville is now History! And, what a glorious history it was. 27 Pottermen, 1 Potter spouse of a deceased Potterman, and 25 spouses of Pottermen attended. The list below gives you names, email addresses and telephone numbers for everyone there. You can click on any email address to send an email to that respective Potterman. Reunion Photos - If you click on the link to Reunion Photos at the left you can see some candid shots of the gang. As more candid shots become available we will add them to the gallery. If you have shots, send them. If digital, send them by email. If film, mail them to me. I'll scan them and return the originals, if you need them back. Old Potter Club Photos - Several great photos surfaced of Pottermen from the past. If you have one available, mail it, I'll scan it and return it to you. We have scanned the Potter Club pages from the yearbooks 1950 through 1958; and 1965. We will soon have 1963, 1964, and 1966. If you have a yearbook other than the ones listed here and it is in in good condition for scanning, please mail it to me so we can scan the Potter Club pages. If you have the capacity to scan the pages, scan them and forward the files. Contact me if you have questions about the process. Sept 12, 2005: Registrations received to date: 28 (27 Pottermen; one spouse of a deceased member; 25 spouses; total attendance: 53). Number going on the tour: 47 A late message from Pete Telfer indicates his wife will now be unable to attend. Sept 5, 2005: A regret received from Al Kaehn, 1951. He will be on a 50th Wedding anniversary cruise within a few days of our Reunion. Congratulations to Al and Melina! Dave Sully is working on a few more lost Pottermen from the 1963-1966 era. We need a camera man for the Reunion. Digital is preferred, but we will take whatever we can get. If you might be the person to help, let us know so we can plan. Sept. 3, 2005: Contact has been made with Jim McCormack, 1957, and David Sully, 1966, both of whom are Chautauqua Region "locals." We expect both will be sending registrations to us within days. Another regret has been received. Fred Culbert, 1965, not available this year, but looks forward to 2006 and the 75th. Roger Sherman has returned his survey form. Contact was made with two Pottermen who had not been reachable because of bad addresses. Bill Bonesteel, 1957, and Roger E. Sherman, 1961, have been mailed the survey. We still have not heard from about 360 others. The Survey Results will be formally presented at the Reunion and implications will be discussed. In the meantime you can read the report by clicking on Survey at the left. Following the Reunion meeting the complete survey report will be subject of a newsletter along with results of the discussions. The same information will also be available here. Paul Ward reports having a copy of the Constitution. Copies will be available at the Reunion. Aug 23, 2005: One cancellation has been received (Dave Manly, unfortunately had to change his plans). See the up-to-date list below, now rearranged by Class year. One more regret received today from Bill LaBarr. We need a copy of the Potter Club Constitution. Can anyone help? A new link is at the left. Click there and you will be able to read news items moved there from this page. This Archived News will stay as long as it is useful and to serve as a record of past events. Aug 17, 2005: New logo now ready for use on apparel, stationery, and web site. See upper left corner. If you want a copy of the file send me an email request. You can also see the logo full page by clicking on the logo at the upper left. We have also made a change in the Schedule of Events locations. Bob has been successful getting us into the new Desilu Playhouse as an alternative to the Luci-Desi Museum. You can get up-to-date info on the new site by visiting the link: http://www.lucyball.net/page.php?link=jamestown This new stop will provide a more complete experience, and "one-stop shopping" with hardly any walking involved. Aug. 5, 2005: This is the "deadline" date for registration. We are still accepting registrations, however. We are very pleased to announce that our banquet keynote speaker, the "Special Event" mentioned in the Schedule of Events, will be Judge Dan Joy, 1952. In his Life Path Events submission he indicated he has been a Judge of New York City Civil Court, New York State Supreme Court, and Appellate Division 2nd Department, 1983-2000; and is now a volunteer tutor in the New York City School System (Learning Leaders), from 2000 to present. We are most fortunate to have Judge Dan with us to celebrate our Theme, "Public Service - A Legacy of All Pottermen." There may be a few more attendees still to be heard from. If you know someone not yet registered, give them a call and remind them it is not too late, yet. Or, send us an email and we will call them for you. June 30, 2005: The Reunion Brochure went in the mail (1st Class mailing) to 262 Pottermen. Click on the Reunion 05 Info at the left to get more info about the reunion and the complete brochure. This is still a temporary home page to get us started. Visit some other frat and sorority web sites for some ideas. Some are listed in links at the left. You may know of others. Send Stuff! If you can contribute some content for the topics listed at the left, send them to me. If you send something, indicate whether you want to be quoted on the site, and have your stuff put on here directly. Otherwise we will treat it anonymously. 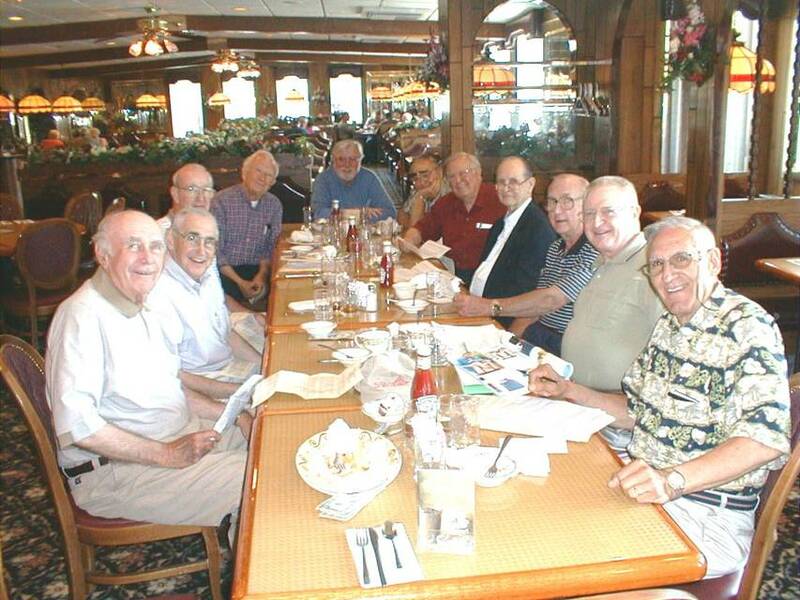 June 8, 2005: Meeting of the Albany Area Potter Alumni at 76 Diner in Latham. Attending were: Art Batty, Jim Morrissey, John Morrissey, Tom Yole, Howard Lynch, Jim Panton, Paul Regan, Milan Krchniak, Paul Ward, Ken Doran, Bob Lanni, Jack Higham, Tom Benenati. Howard shot the photo below, so unfortunately he is not in it, and Art had to leave early, so he is missing, too. The other shot is of Paul Ward outside the restaurant. Handsome guy, isn't he, (despite his advancing years)! The guys are lined up in the order above from the left. Art had been sitting to Jim Morrissey's right, in the foreground. Howard was sitting between Tom and Jim Panton. The group looked at draft copy of the 2005 Reunion Brochure being prepared by Bob Sage's committee, and offered some comments to help the process. It was noted that 2006 will be the 75th Anniversary of the founding of Potter Club. Preparations for this major event are beginning now, even as we move forward with the 2005 Reunion. What to do; Where to do it: When to do it: Who should be invited: How it should be conducted; are among the issues we need to address, and will at the 2005 Reunion in the Jamestown, NY area (Mayville, NY), September 13-15, 2005. Plan to attend!! Watch for your brochure in the mail. If you haven't received one by mid-July let me know. We plan to mail by July 1. We need a reply/reservation/registration by August 1, 2005. May 3, 2005: Reunion Date is set for September 13-15, 2005, in Western New York (Jamestown area). The schedule proposes a travel day and arrival on Tuesday, 13 Sept. Events and tours on Wednesday, 14 Sept. This leaves Thursday and Friday open for travel and/or leisure in order to meet any following weekend commitments. Proposal would also have a "mixer/social" the evening of the 13th. This info from Bob Sage. More Reunion Info: As more detailed information is developed we will have it in the link at the left. Survey Returns: Progress is being made reaching many Pottermen who had not returned their surveys. If you are one of these folks, or you can reach someone from whom we have not heard, please encourage the return of the survey. We have received 176 so far.